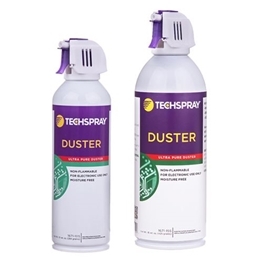 Air Duster, also called “canned air”, “compressed air”, and “dusting gas”, is used to provide a pressurized blast, knocking loose dust and dirt. Think of it as a portable replacement for an air compressor line. This can be used to blow out cookie crumbs from a keyboard, clear out computer vents, and even open up tight apertures in an SMT (surface mount technology) stencil in PCB assembly. It’s one of those products that seems simple but leads people to many misconceptions. We’ll cover the most common questions and misconceptions about duster, but if we missed your specific question, leave us a comment below or contact us and we'll get it answered. DME – DME is rarely used and in many areas cannot be legally used because of safety and environmental concerns. DME is extremely flammable and is a VOC (volatile organic compound), which can contribute to smog. 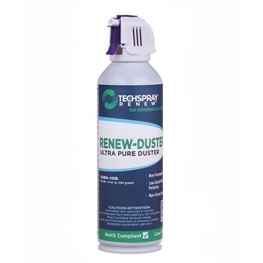 All of the other duster alternatives do not contain VOCs. On the back label, look for “Dimethyl ether” or CAS #115-10-6. 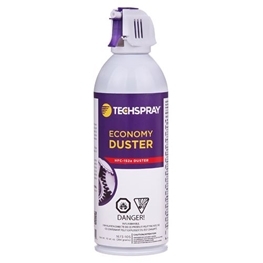 Check fill weight – Retail duster can come in a variety of fill weights (the content of the material in a can) including 3.5 oz., 8 oz., 10 oz. and larger. This can only be judged by the label since the size of the spray can may not vary. There is a misconception based on old information that dusters hurt the ozone layer. Dusters contained CFC’s over 20-years ago, but have since been replaced with materials that do not impact the ozone layer. What Are The Additional Features of Aerosol Dusters? Chrome trigger/refill cans – Some dusters includes a chrome trigger sprayer and a refill can with a threaded valve. This allows you to reuse the sprayer and purchase refill cans. The advantage of the chrome sprayer is more precise control over spray force and ESD (electrostatic discharge) control. The standard plastic sprayer has the potential of building up a static charge as you spray. The chrome trigger is conductive, so will not build up a charge, and has the potential of being grounded. For example, if the user is grounded by a wrist strap, the sprayer and can be grounded as well if in good contact with the person’s hand. What’s The Correct Technique for Dusting? To achieve the optimum force out of a can of duster, spray short three to five-second blast at room temperature. When an aerosol duster is sprayed continually, it acts as an efficient heat sink and will cool down. This lowering of the can temperature also lowers the internal pressure of the can, which will greatly decrease the generated force. What Are Some Alternatives to Aerosol Dusters? Shop air – In an industrial setting, dropping an airline is very common. In this case, a compressor constantly keeps the line pressurized with air. It can be an economical way to blow off dust, dirt and other contaminants, but you are tethered by the airline. This gets to be impractical for field work or in-house work that requires more flexibility. In addition, contamination can be brought through the airline from ambient air or oil from the compressor. Bulb dusters – Photographers will be familiar with the bulb type blowers that are often used for lens cleaning. 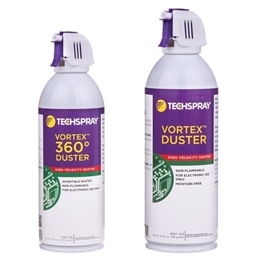 These may be an economical solution for very light dust, but the force generated in a small fraction of aerosol duster. As the above details demonstrate, care needs to be taken even when choosing an everyday consumable like a duster. Reach out to us or your distributor for help deciding which duster is right for your application.